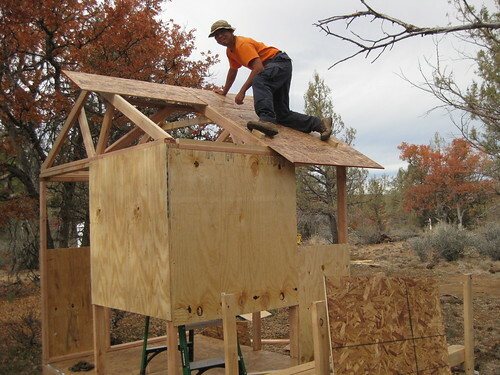 What: Help me build another hut. Come hangout2. How: Post a comment to this post (make sure to post the comment on the blog, not on Facebook, and to leave an email address). 1 – Specifically, anyone who knows me, or reads this blog. Though, depending on various factors, it might not be possible to accommodate everybody (this time). 2 – If there’s sufficient interest, the date for Campout 1.0 may change. My friends are welcome to come visit any time, really. Pick a weekend. I’ll be up here, basically full time after 8/10. So Ryo… would you like me to blog on it… I bet you’d get some takers. I’ll check with my wife, the weekend schedule keeper, I’d love to come help for a couple days. It’d be great to have you up here; I could sure use your expertise. Nice, so you have a design already picked out? Better plan on a couple more reminders between now and the build date. People may forget and get double booked. I too gotta check with the wife, and the travel agentcy, but it does sound like a lot of fun. Out of curiosity, what is the closest major airport? I think that would be Sacramento, CA (SMF). But Redding, CA might have some kind of regional airport and would save a couple hours drive. I may be in that neck of the woods in late August. I am a casual reader of your blog and am based out of Santa Monica. I produce video content for the web, not that I would be producing anything if I come up there, but I do enjoy what you are doing. Which direction from Redding? I have an Aunt moving to that area now and could stop by.